This weekend we climbed a mountain. 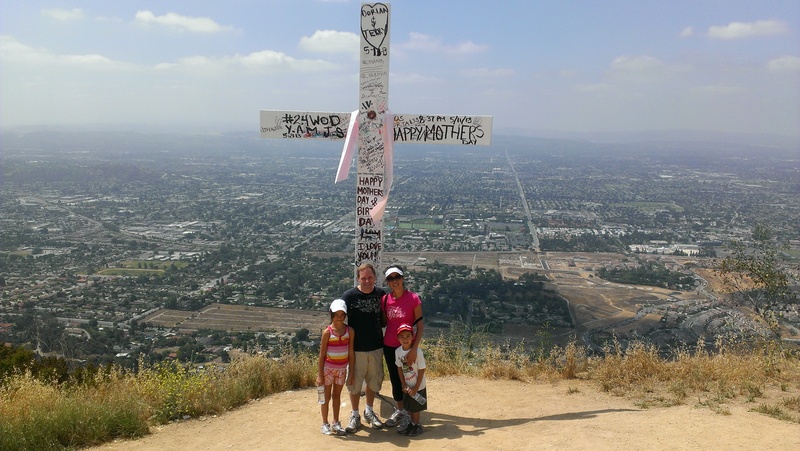 Quite literally, we hiked the Garcia Trail up at the back of Azusa, up past the overly proud, white “A” emblazoned on the hill, up to the cross that is frequented daily by students from the expanding Christian college next door. “I’ll never do that again,” you told me, as did your sister. It was slow going. You were afraid of the sheer cliff that sat alongside the narrow path, and though you were never in any danger, the higher we got, the more you sounded like a kid mounting a diving board. We had to hold hands most of the way to the top. Your sister was not much better. It was a complaint parade with grunts like a timpani and whines like a clarinet, with stops under every shady overhang we could find. On the way down you and I walked a few feet in front of the girls. I told you about being a leader and being brave, and how when times are hard, your family needs you to be a brave leader. “Hm,” you said. I think it was assent. I wonder how much these moments will sink in over time. Up at the top, the cross is ironically graffitied. I’m not sure who decided that was appropriate. It overlooks a vast 180 degree panorama of LA, all the way to Catalina island, and on the other side an equally sized panorama of national forests, spotted with reservoirs. Cars wind through a lonely valley road, far enough away to seem like a silent movie of a leaf floating down a river. Here I’m struck with an irony that we climbed to the cross. I mean I get it, but it’s all wrong. That first cross initially sat atop a hill, and placing them on top of hills today is sort of an implicit declaration of superiority and finality. Jesus’ cross and our crosses are the parentheses that swallow all the history in between. But theologically, it’s all wrong. We don’t climb to the cross; it descends to us. The whole point of the cross was that our climbing up was ineffectual, and so he climbed down. The cross was ultimately replacing our useless ladders with his working one. So I’m afraid I’ve emblazoned on your memory an image of intense perseverance that earns you a view of the cross, when what I want you to know is that the perseverance was all on his part. I wish I had told you that too, but perhaps this will make more sense later. He told us about his hike in Sunday School but mostly that you didn’t see any snakes but did see a squirrel. Sounded like a wonderful family experience to me.